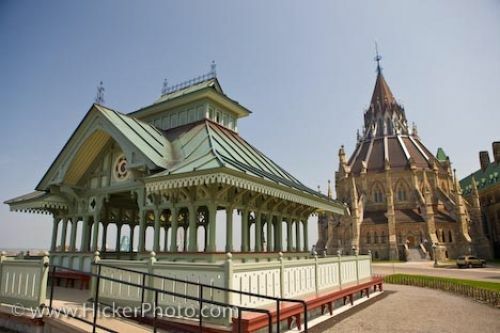 This charmingly detailed pavilion looks modest compared to the ornate Library of Parliament in the city of Ottawa. This enchanting pavilion looks like a doll house. The historic library is part of Parliament Hill in the city of Ottawa. The library was constructed in 1876 but has been renovated several times. Pavilion beside the Library of Parliament on Parliament Hill, City of Ottawa, Ontario, Canada.